China's display maker BOE Display aimed to start mass producing AMOLED displays at 5.5-Gen LTPS OLED fab in Ordos in the second half of 2015, but according to a new report from Digitimes it is still struggling with low yields, preventing it to actually starting to ship any panels. BOE is also constructing a Gen-6 LTPS LCD/AMOLED production line in Chengdu, China - with a projected investment of about $3.5 billion. The fab is scheduled for production in the first half of 2017, with a capacity of 45,000 monthly substrates (both OLEDs and LCDs). Digitimes says that BOE aims to produce flexible OLEDs at that new fab, and will purchase flexible OLED production equipment from Korea and Japan. 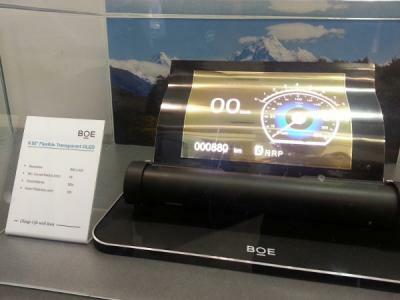 In May 2015, BOE demonstrate several new AMOLED prototypes - including a 9.55" 640x432 flexible transparent panel, a 4.8" 480x800 flexible AMOLED and regular glass-based 5" FHD and 13.3" WQHD (2560x1600) AMOLEDs.